The Mid-Sleeper Bed Frame Set by Verona is an excellent addition to any child's bed room due to the height of the bed adding a fun aspect to bed time and this style also offers space saving solutions, offering additional storage. 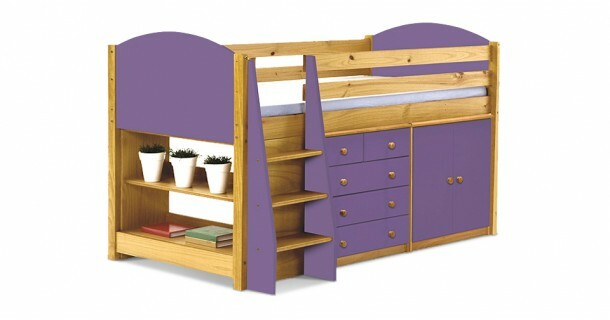 Mid Sleeper Beds are also an excellent choice for those who don't want their children in a High Sleeper yet but wish to accomodate extra storage into their bedroom. This bed frame also comes with a storage set included in the price and this is available in a variety of colours to ensure that the bed frame can match the decor of any bedroom and add a more personal touch. The Mid-Sleeper Bed Frame Set by Verona is made from pine offering a strong and durable sleeping solution. Please quote this Products's code 81043B to speed up your query if related.